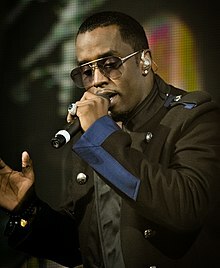 Harlem, Manhattan, New York City, New York, U.S.
Sean John Combs (ojoibi November 4, 1969), to tun gbajumo pelu awon oruko itage re Puff Daddy, Puffy, P. Diddy, ati Diddy, je olorin rap, akorin, akowe-orin, osere, akotun awo-orin ati onisowo ara Amerika. Won bi ni Harlem, o si dagba ni Mount Vernon, New York. O sise bi oludari talenti ni Uptown Records ko to da ile-ise ti e Bad Boy Entertainment sile ni 1993. Awo orin re akoko No Way Out (1997) ti gba iwe eri platinomu meje. Combs ti gba Ebun Grammy meta ati MTV Video Music Award meji, ohun si ni atokun eto telifisan MTV Making the Band. Ni 2017 Forbes so pe ola re to $820 million. ↑ Traugh 2010, p. 13. ↑ Robehmed, Natalie (June 12, 2017). "Celebrity 100: The World's Highest-Paid Celebrities Of 2017". Forbes. Retrieved September 24, 2017. ↑ 3.0 3.1 "Diddy ($820 million) - pg.6". Forbes. May 2017. Retrieved May 11, 2017. ↑ Aiello, McKenna (August 27, 2016). "Diddy and Cassie Are Officially Back Together as He Throws Her Epic 30th Birthday Party" (in Èdè Gẹ̀ẹ́sì). E! News. Retrieved August 13, 2017. ↑ Bush, John. "Artist Biography [Sean Combs]". AllMusic.com. Retrieved April 15, 2014. Harrison, Thomas (2011). Music of the 1990s. American History Through Music. Santa Barbara, CA: Greenwood. ISBN 978-0-313-37942-0. Jones, Jen (2014). Sean "Diddy" Combs: A Biography of a Music Mogul. African-American Icons. Berkeley Heights, NJ: Enslow. ISBN 978-0-7660-4296-4. Traugh, Susan M. (2010). Sean Combs. People in the News. Farmington Hills, MI: Lucent Books. ISBN 978-1-4205-0237-4. Àtunṣe ojúewé yi gbẹ̀yìn wáyé ni ọjọ́ 4 Oṣù Kọkànlá 2017, ni ago 09:07.